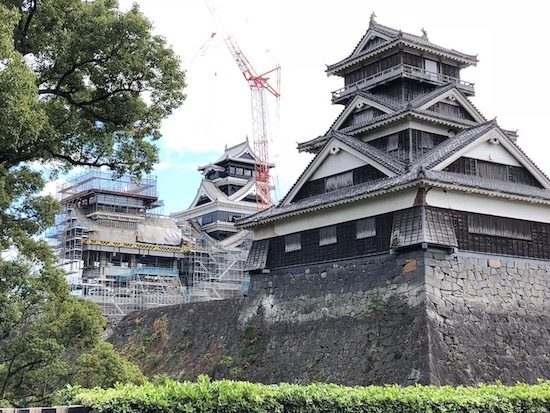 What is the Shiromegurin Kumamoto Castle Sightseeing Bus? 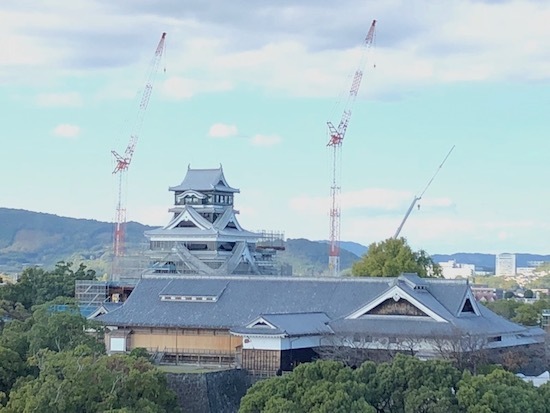 Kumamoto Castle is Kumamoto’s most famous tourist spot. Did you know there is sightseeing bus dedicated to making travel around the castle convenient? 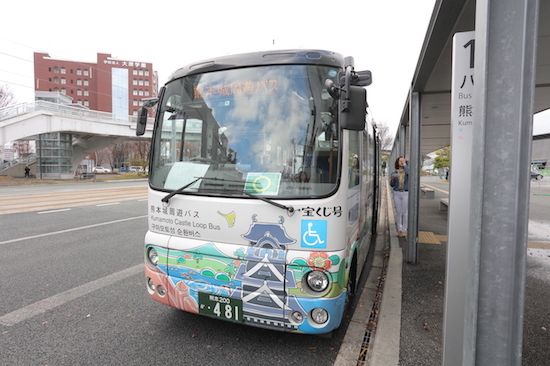 The name of that bus is the Shiromegurin Kumamoto Castle Sightseeing Bus. 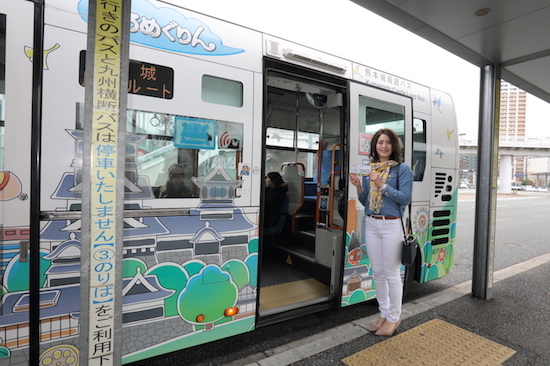 The bus departs from Kumamoto Station, makes a loop around various interesting spots around the castle, then goes back to Kumamoto Station. When and where does the Shiromegurin run? 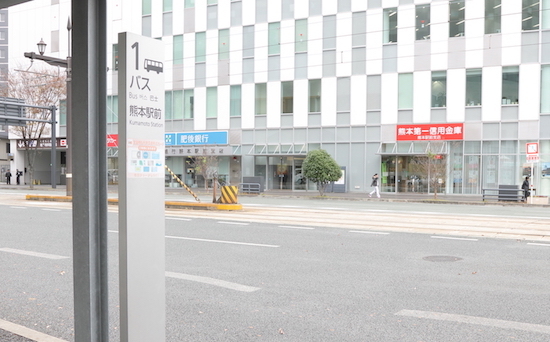 The bus runs from Kumamoto Station and stops at different areas around the castle, like the Kotsu Center Bus Terminal, Johsaien, and Kumamoto Castle Ninomaru Parking, then makes stops in the downtown area, like at Kumamoto Hotel Castle and City Hall, then returns back to Johsaien and the Bus Terminal and then Kumamoto Station. Each loop takes about 65 minutes, and the bus runs every 20 to 30 minutes everyday from 9AM to 5PM, with 22 loops each day. Leave the station from the Shirakawa (East) Exit and head left to the Shiromegurin bus stop in front of the New Hotel Kumamoto. Most of the Shiromegurin seats are for single passengers. Right after departing, the bus travels through the historical castle town area of Shinmachi where you can enjoy the sights from the bus windows. Get off at 4. Shinmachi and take a break at Nagasaki Jiro Café. The atmosphere of the Shinmachi area is that of old-school, retro Japan. 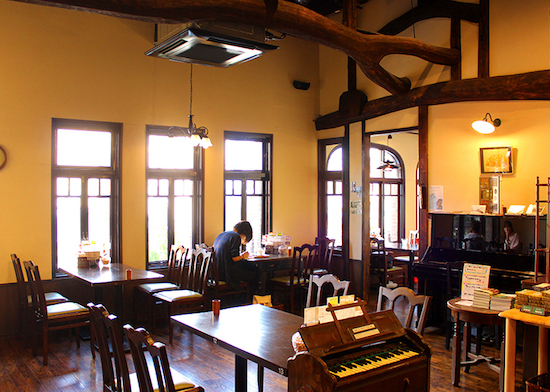 Nagasaki Jiro Café is located on the second floor of the Nagasaki Jiro Bookstore, which is a National Tangible Cultural Property opened in 1874 and was frequented by famous authors like Natsume Soseki and Lafcadio Hearn. Have a relaxing cup of coffee in this historic, old-fashioned café. Sakura-no-baba Johsaien, located at the foot of Kumamoto Castle, is home to the Sakuranokoji Kumamoto Castle Shops, which offer all kinds of local souvenirs and gourmet treats, and Kumamoto Castle Museum Wakuwakuza, a museum about Kumamoto Castle with interesting exhibits including an exciting Kumamoto Castle VR Experience. Johsaien is perfect for visiting either before or after the taking a look at the castle. 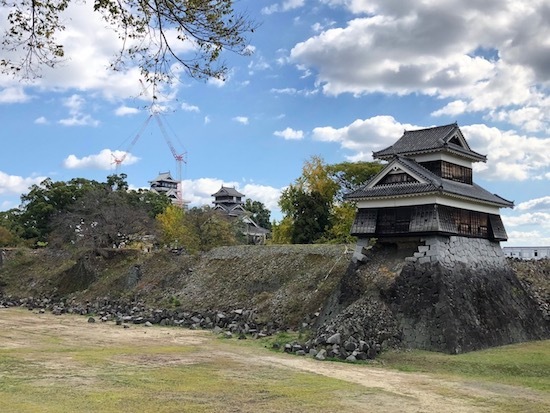 After getting of the bus, you’re greeted by the spacious Ninomaru Park, which offers excellent views of the castle keeps and the famed Uto Turret and is a popular photo spot. A tour path has been built to follow around the castle. 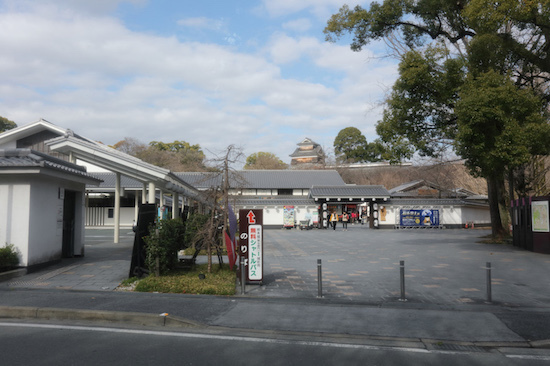 The Kumamoto Prefectural Museum of Art is located at the edge of the park. 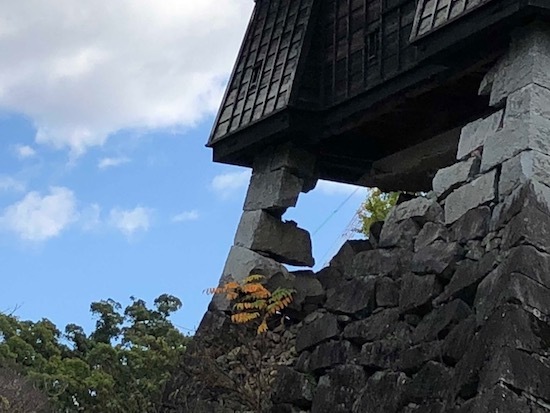 Along the Ninomaru tour route, you’ll soon come across the Inui Turret, which just barely avoided complete collapse by miraculously being held up by a single column of the stone foundation that stood strong. 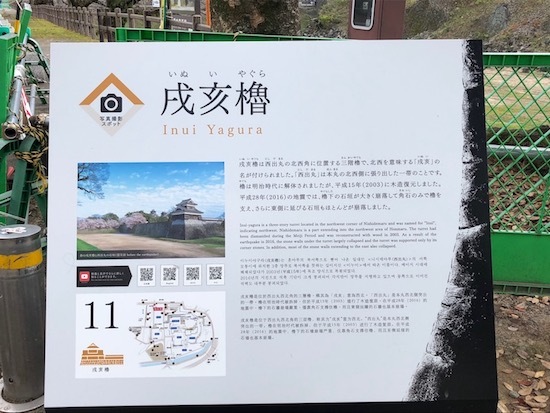 The Iidamaru Turret was also propped up by a single column of stone immediately after the earthquakes but has since been disassembled for reconstruction. 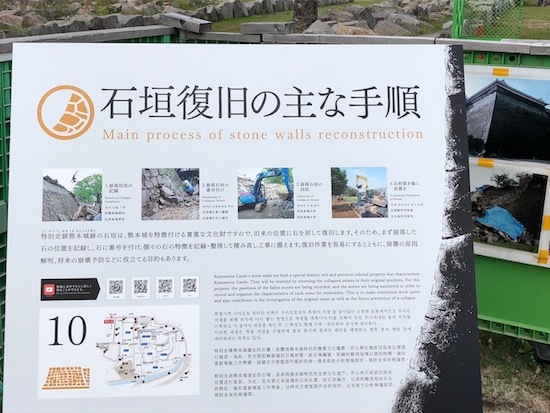 Information panels are set up along the Kumamoto Castle Reconstruction Tour Route with more detailed information. 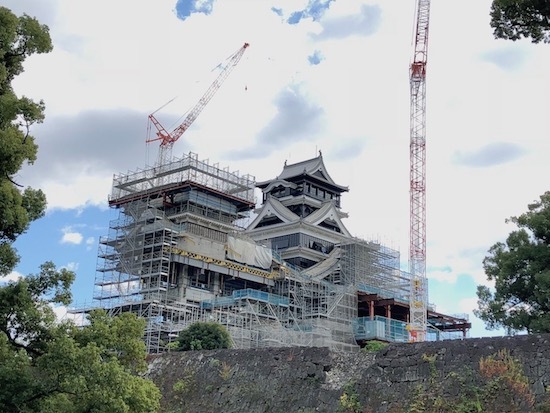 Kato Shrine offers up-close views of the ongoing repairs of the Main and Minor Keep of the castle. 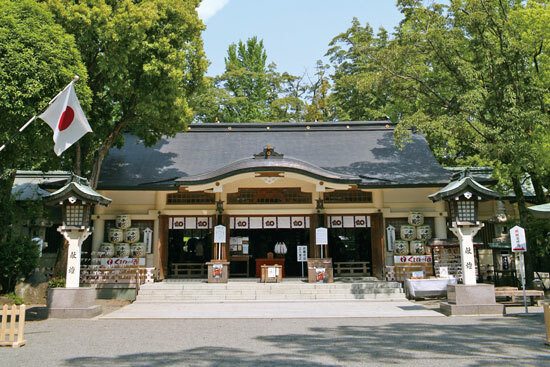 Kato Shrine is named after the famous Kato Kiyomasa, a lord of Kumamoto who built Kumamoto Castle and implemented many projects that brought prosperity to Kumamoto. 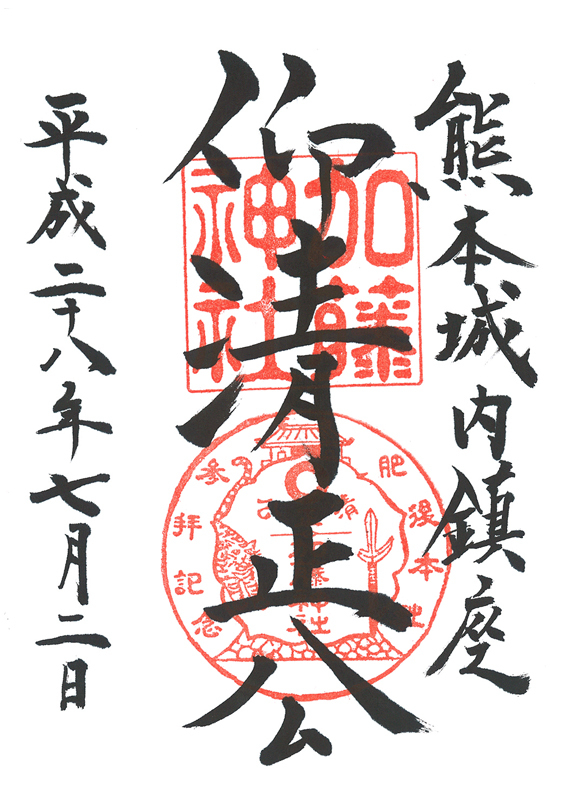 You can get a seal stamp at the shrine shop, where they also sell seal stamp collection books. From within the shrine grounds, you can get pictures of the Main Keep, Minor Keep, and Uto Turret, all in the same shot. 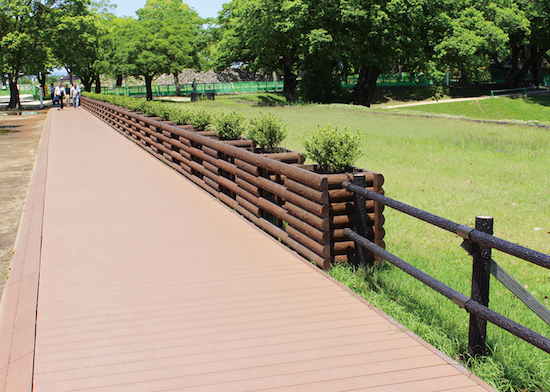 The Ninomaru Gate was reopened to foot traffic on November 23rd, 2018, allowing visitors to walk easily between Ninomaru Park and the Sannomaru Area, which is where the Kumamoto City Museum and Sannomaru #2 Parking are located. 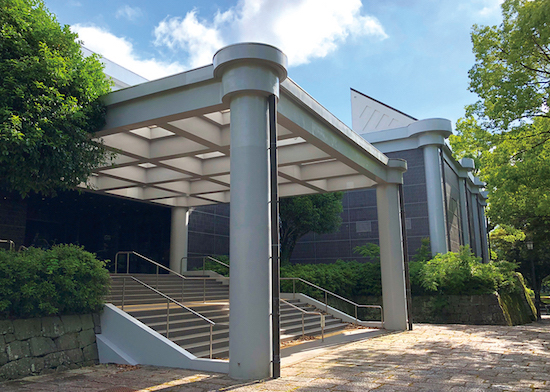 Additionally, the Kumamoto City Museum opened after undergoing renewal construction on December 1st, 2018 and its popular planetarium has also been reopened to the public. Get off at 15. City Hall and you’re almost downtown. The 14th floor of City Hall offers sweeping views over the entirety of Kumamoto Castle. And because it is City Hall, admission is free! Here are two places we recommend for lunch that are just a few minutes’ walk from City Hall. First is Ougon Ramen Ginza Store on Ginza Street. 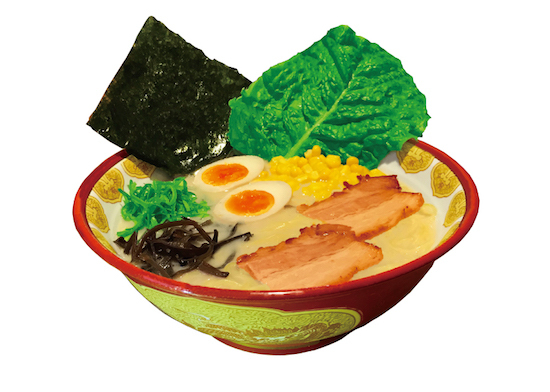 Ougon Ramen is famous for its Ougon Kanjuku Tonkotsu Ramen, where the hearty pork-based soup is accented with ripe fruits to give the ramen a slightly fruity and mild flavor. Ougon is open 24 hours, so you can stop in for lunch at any time of day (or night!). The second is Batan Gyutan. Lunch is available here until relatively late, so you can stop by after having a walk around town. 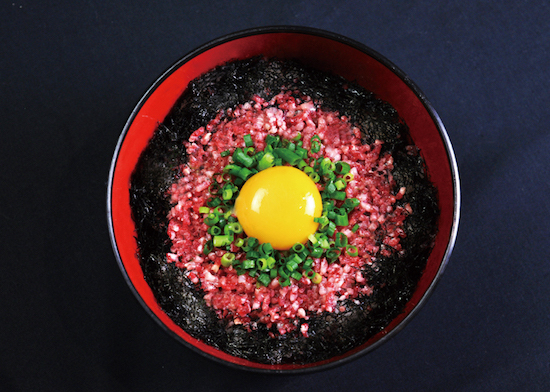 Lunches center around horsemeat or beef and include an Akaushi-don (rice bowl), made with Kumamoto’s famous Akaushi beef, as well as Uma-don (horsemeat rice bowl), Akaushi steak, and basashi (horsemeat sashimi). Each ride on the Shiromegurin costs just ¥150 (¥80 for children), no matter how far you go. Single day passes are available for ¥400 for adults and ¥200 for children and are available for purchase on the bus. Today, our bus driver was a woman and we spoke with her for a bit after our ride. 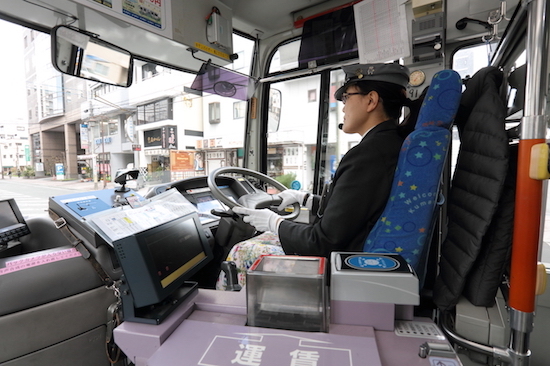 A question drivers often hear is whether they accept IC payments, and the answer is that they can accept payments through some services, like Suica. 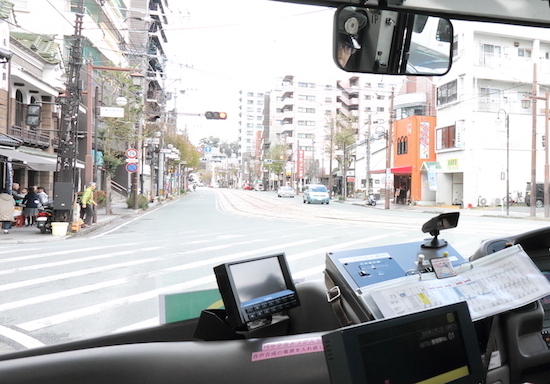 The Shiromegurin bus isn’t just convenient for sightseeing, it’s also cheap! Taking the tram from Kumamoto Station to the downtown area costs ¥170 but taking the Shiromegurin costs just ¥150!